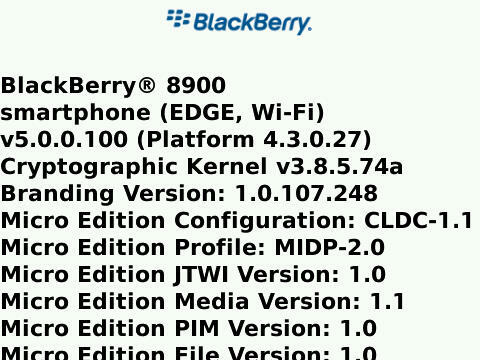 Leaked: OS 5.0.0.100 for the Bold and Curve 8900! Wanting to give OS 5.0 for the BlackBerry Bold or Curve 8900 another go? The last we posted in the blogs on OS 5.0 it was version 5.0.0.93 that was available, but now 5.0.0.100 has popped up in the wild for these same devices. CrackBerry junkies may want to give this newer version a download and install (download for Bold; for Curve 8900, but keep in mind that many of your existing apps may not yet work properly with this newer OS (BlackBerry JDE 5.0 is now available to developers, so the apps should catch up with the OS quick). I should also point out here that I set up a new blog post category for "BlackBerry OS" so you can always/easily find the list of recent unofficial OSs that have been blogged about.